Before Liam's first day of school, the parents were given a bit of homework. I may have squealed with delight! I am more than thrilled to jump back into all things school. I may just need a new set of pens & pencils for this! My first assignment was to make a photo collage of Liam and all his favorite things, so naturally I got to bust out my glue stick. Also, I had to fill out a Get to Know You questionnaire. Conor asked if this was my project or Liam's...? Mine. Most definitely mine. I forgot to snap a pic before Liam had to take it school, so unfortunately you all don't get to see the finished result which I may or may not have simply nailed! Me: What do you want to be when you grow up? Liam: A lifeguard. And I will sit in a special chair. Me: What was something you did when you were little? Liam: Eat Nini! Never before has Liam answered the "what do you want to be" question, so I was surprised when he was so confident with his answer! He was either heavily influenced by his swimming lessons this summer or his Curious George Goes to the Beach book. Either way, I'm pretty sure with his beach blonde hair & tan skin that he would be the quintessential lifeguard. We'll see if this ever becomes a summer job of his. Or perhaps just a halloween costume this year. And that second question just melted my heart. For those that haven't been reading here for long, "Nini" is the word Liam used for breastfeeding. I was fairly sad when Liam weaned, especially when I thought about how he would forget that time of his life and those special moments. It so warmed my heart that as an ever growing toddler he has not forgotten. He has such sweet memories. I can tell that he remembers how much joy it brought him. Especially when he gets excited for Finn to nurse. He knows that Nini makes Finn happy too! While some might find that answer strange to put down for his preschool teacher, I was proud of his response. Liam keeps growing into himself, and I love each day that I get to see more & more of the boy & man that he will become. He is an extremely special little boy, who is destined to do great things! I just know it! 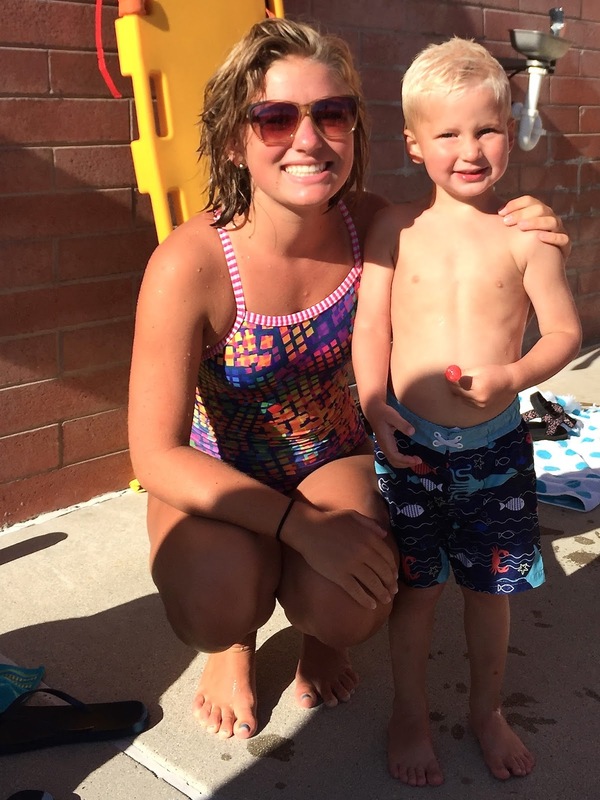 And because every post needs a picture, and it needs to be somewhat relevant... Liam with his swim teacher Calli (and a possible first crush). Oh I love both of those responses! And I can totally see Liam being a lifeguard, even if it's just for Halloween ;). awww he is so adorable! love both of his responses. Love both of those answers!!! Me too! Our little conversations keep getting better & better! So sweet that he mentioned nursing. I always think about how comfortable Lily is with nursing and love that she is being set up with a great foundation to educate and support her generation in the future! Maybe I'm thinking too much into it but maybe not! So sweet! I love that he wants to be a lifeguard. And you're right, he would make the perfect one with that blonde hair and tan skin! Love it. And so sweet that he said nini! Just a small reminder that kids really do remember things, especially special things!